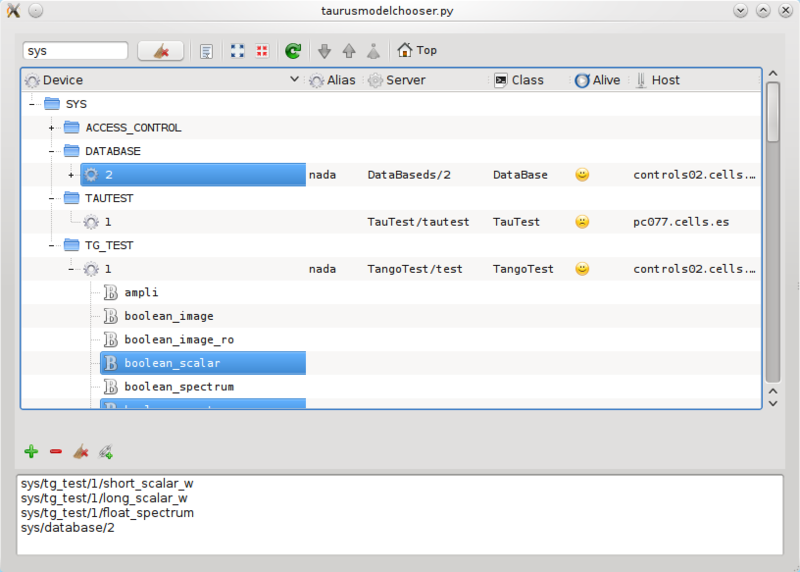 The TaurusModelChooser is a tree based widget used by Taurus applications for prompting the user to choose one or more attribute/device names of the control system. Browse the tree to locate the devices and/or attributes you are interested in. Add them to the Chosen models list (the bottom part of the widget) by using the Add button (the “+” icon). Repeat previous steps if you want to add other models or use the Remove button (the “-” icon) to remove models from the Chosen models list. Click the Update Models button to apply the changes when satisfied. Important: The tree can be quite dense. You can filter it by typing part of the device name in the Filter box (#4 in the figure).